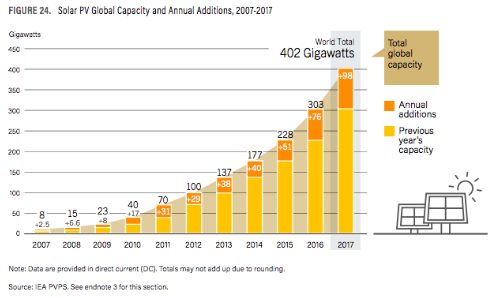 The Global Status Report on Renewables from 2017 provides glimmers of hope towards a more sustainable future: new solar photovoltaic installations surpassed net additions of fossil fuels and nuclear power combined. Solar is transitioning into the mainstream, as a proven technology with wide-scale adoption. Within solar, microgrids are picking up as an effective way to target the unelectrified, combating health and education issues. The continual surge of world-wide enthusiasm and eagerness for solar energy is a multi-faceted development. Solar has shown a substantial decrease in price: from $2.00/watt in 2014 to $0.50/watt contemporarily. The price reduction, combined with solar’s allowance for consumers to produce energy locally and independently, have played a heavy handed role in the escalating photovoltaics market. Moreover, the increase in global demand for solar is attributed to the growing need for electricity incorporated with an escalating awareness of the detrimental effects of greenhouse gas emissions. In 2017, global economic prosperity and technology dependence led to an estimated 2.7% increase in overall energy demand. Growing energy demand brought higher rates of carbon dioxide emissions for the first time in four years, at an estimated 1.4%. GHG emissions continue to be a major driver towards sustainable energy – with the amount of cities deriving electricity from at least 70% renewable sources more than doubled from 2015 to 2017. In the United States, solar continues to be the leading source of new energy generating capacity. India more than doubled the GW installation from 2016, increasing 4 GW to 9.1 GW. 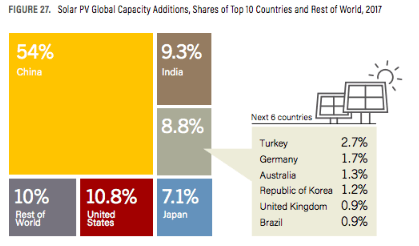 Solar is India’s #1 source of new energy capacity, ahead of coal. The U.S. solar industry employs over 250,000 people – about three times more than the coal industry – with approximately 40% in installation and 20% in solar manufacturing.5 The European Union increased solar PV capacity by 6 GW in 2017, for a total of approximately 108 GW. Germany, the United Kingdom, France, and the Netherlands are leading the EU in solar installations and trends. Solar installations have increased in Australia – and have brought cheaper prices than retail electricity from the grid in several regions. Latin America and the Caribbean are rapidly expanding markets for solar, with expectations for tremendous growth. In the Middle East, an abundance of countries have created ambitious goals for increasing solar technology, driven by decreasing costs and climate change objectives. Africa is utilizing solar to meet rising demands for energy access. A combination of off-grid and mini-grid solar systems are providing energy equity across the continent. A world-wide drive for increased solar capacity has created record-low bids for solar PV. Technological advancements have increased efficiency, reducing the number of modules required to maintain a given energy capacity, which has contributed in addition to falling prices. Evolution of solar technology has improved overall solar performance: inverters are more reliable, energy storage increases cost effectiveness, and the use of new materials increases system yields. Solar technologies have a long-ranging lifespan, from 10-25 years, and a majority of said technologies can be recycled at the end of their useful life. Distributed solar technologies allow for stand-alone systems to function on the grid, off-grid, or as a mini-grid. In many rural locations, distributed renewables such as solar enable the livelihood of millions. Mini-grids allow for cost-effective means of generating electricity for mechanics, cooking, studying, medical care, and refrigeration. Solar microgrids have a cost-benefit ratio that includes reduced chronic and acute health effects, improved lighting quality, increased school retention, increased income, and reduced negative impacts on forests. 38% of the global population, and 50% of the population in developing countries, live without access to clean cooking facilities, relying on inefficient, unhealthy, and unsafe open fires in combination with rudimentary cook stoves that operate on biomass and coal. Solar PV has gained quick tractions with mini-grids. Through combining solar microgrids with highly efficient low voltage appliances, annual electricity costs can decrease for a rural community by as much as 60%. The year 2017 brought the renewable sector continued technological advances, falling costs for materials, solar innovations, and increased off-grid energy tied systems. As countries have become increasingly aware of the need for energy equity and the health hazards from unreliable power and dirty cookstoves, all regions of the world have shown an increase in solar GW and MW production. As the world moves towards a more electrified future, trends in solar renewables have shown that cost, ease of access, and reliability are forefront values.